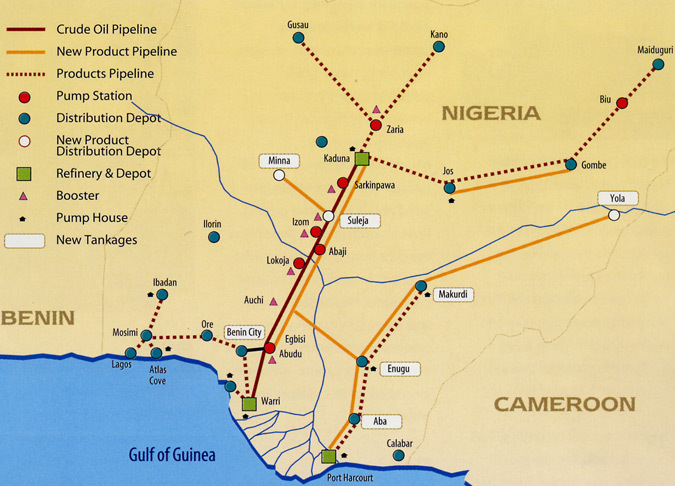 In the mid 1970's the Government of Nigeria decided to construct nearly 2,000 miles of pipelines, a new refinery and 19 storage depots throughout Nigeria. The programme was initiated to meet future fuel demands and to overcome current shortages caused by the inadequacy of existing road and rail services. Numerous projects were put into motion representing an investment of £450 million at 1977 values. One of the projects was Nigerian National Petroleum Corporation's (NNPC) pipeline system 2C, a 370 mile pipeline from Warri to Kaduna. Starting in the rain forest the pipeline crosses through savannah type terrain before reaching desert conditions surrounding Kaduna. Initially the pipeline was designed for crude oil but used on a batch basis carrying refined fuel such as gasoline, kerosene and gas oil from the refinery at Warri to Kaduna. Later the pipeline was used to pump crude oil to the refinery at Kaduna. Installation of 25 Allen S37 engines for the pipeline system was undertaken in two phases. Phase 1 began in 1977, when upon construction each of the three pumping stations were equipped with three Allen 8-cylinder, 1,684 bhp engines driving high-speed multistage centrifugal pumps, through epicyclic gearboxes. The speed range of each engine is maintained between 350 and 600 rpm as the flow of crude oil is dictated by demand at the Kaduna refinery. Accessibility for construction of the pipeline was a major problem because the roads were not made for heavy construction equipment and there were numerous river crossings to overcome. Despite this, by April 1980, a new refinery at Kaduna became operational allowing pipeline 2C to pump crude oil for refining and then distribution from Kaduna itself. Hot ambient conditions required the designing of pumping stations to be as open as possible, to allow maximum ventilation. Each pump set is self-contained on a fabricated-skid base incorporating a firewall, mounted between the gearbox and the flywheel of the engine, to minimise fire hazard should there be a crude oil leak at the pump end. The engines employ a pneumatic control system to ensure no hazzard is generated. To enable the engines to run on crude oil specialist equipment was developed by the Allen Diesels’ business for treating the crude oil fuel using centrifugal purifiers. A common tank, filled by crude oil taken from the pipeline is mounted with two centrifuges. Following purification, the oil is pumped to individual heated and insulated fuel service tanks with capacity for 16 hours operation at full load. From the service tanks the fuel flows, by gravity, to a crude oil module which has Duplex crude oil filters, a crude oil pressure pump and a crude oil heater. There is also a distillate oil section for pressurising the distillate fuel system. Engine start up is on distillate fuel, but when selected crude oil operation changeover is possible through valves incorporated in the crude oil module. This happens as soon as the pressure and temperature of the crude oil fuel reaches a defined point. The engines automatically revert to diesel operation if a fault develops or if a set is shut down when crude oil is purged and flushed from the system before the engine is stopped. Control can be either automatic or manual and the control panel for the engine pneumatic speed governors also incorporates automatic control of the suction or delivery valves of the main pump. Comprehensive measures were taken on account of the particular environmental conditions in Nigeria. The dry season is very dusty necessitating large capacity oil bath air-inlet filters which are fitted about 8 ft above ground level on each engine, preventing the dust from entering the inlet systems. In addition to radiator cooling for engine jacket water and secondary cooling water, when ambient temperature goes above 40°C horizontal water-to-air and oil-to-air radiators are installed. In Phase 2 of the programme a further 15 Allen crude oil burning engines were ordered directly by NNPC to drive additional pumps, increasing supply of crude oil to the Kaduna refinery. Housing four sets, three new pumping stations were built and one additional set was installed in each of the three pumping stations built in Phase 1. Installation and commissioning in both phases were carried out by the highly qualified engineering staff of Allen Diesels. The NNPC pipeline has operated continuously since becoming operational and the Allen engines have needed minimal attention. There are currently 34 Allen mainline pump units installed in Nigeria, including four distillate running units. These Allen engines along the NNPC Pipeline have shown their reliability despite the extreme environmental conditions imposed by the high temperatures and the high dust content in the air. The engines are also mandated to run on the various types of crude oil, including oil with high sulphur content. Allen Diesels has established a wealth of experience in pipeline applications through the design, manufacture, installation and operation of its Allen S37 type pipeline engine. Such experience has resulted in a continuous development programme for the S37 for the pipeline environment, resulting in a quite different engine from its early design. To reflect these important step changes in development, the upgraded Allen S37 has been issued with a new name: the Allen 4000 Series. Today, the Allen 4000 Series is one of the world's leading crude oil burning engines. Click here to return to our Case Studies.